It is often very tiresome and tedious when Nowicki loyalists, if we are being kind, or sycophants, if we are being unkind, attempt to discredit this photograph of Rev. Becket G. Senchur, who previously was a monk and priest of the Archabbey of St Vincent, by suggesting it was photoshopped. Very silly to be spreading such unfounded nonsense. For the avoidance of all doubt, and who assist the unenlightened, the following instrument was made, so as to dispel any doubt about the authenticity of the photograph. Personally, I am sure that Archabbot Nowicki and/or a member of his legal team will have no difficulty in explaining the legal significance of this to the next meeting of the conventional chapter and/or the Council of Seniors. Now let us refer to something far more banal and accessible to every member of the monastic community at St Vincent Archabbey, the American Cassinese Congregation Ordo. The 2011 edition records at Entry 51on Page 239, the following information: Becket (Gerald) Senchur, born 17 December 1946 in Cleveland, Ohio. Professed as a monk of the Archabbey on 11 July 1967, and ordained to the Roman Catholic presbyterate on 12 May 1973. Only the good God alone knows exactly why, and on what date Rev. Fr. Senchur left the Archabbey permanently. Due to excellent detective work on the part of the author, it was discovered that a certain Becket Gerald Senchur was living at: 798 Tubman Road, Brewster, MA 02631, a salubrious part of Cape Cod. [ View ] As we like to be diligent, please note the date of birth as recorded in the KNOWN address listing for Becket Gerald Senchur is: 12/17/1946. What a coincidence – that is the same date of birth for Rev. Becket G. Senchur in the American Cassinese Congregation 2011 Ordo. Could we be talking about the one and the same Becket G. Senchur? Wonders will never cease. Now, dear reader, to enable you to have a more complete picture, please note the mortgage details for: 798 Tubman Road, Brewster, MA 02631. Everyone, I am sure will agree that Mr. Senchur paid off that $91,000 mortgage very rapidly. Could Mr. Senchur have received financial assistance from a well funded source to remain silent about a number of issues? Obviously, it is scurrilous of me to repeat again the allegation, but perhaps I’m telling the truth that the allegation remains that the money to clear this mortgage so rapidly came from the Archabbey of St Vincent. 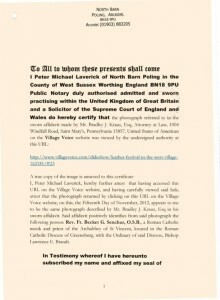 Now, just so everybody knows, a priest in good standing incardinated and subject to the jurisdiction of the Ordinary of the Diocese of Greensburg, is prepared to make a sworn civil affidavit that he recognises Rev. Becket G. Senchur from this photograph with Rev. Becket G. Senchur known to said priest from his seminary formation at the St Vincent Seminary, Latrobe. One hazards to speculate how Bishop Laurence E. Brandt will react. A number of monks from St Vincent Archabbey have indicated they are also now prepared to make sworn civil/canonical statements positively identifying Rev. Becket G. Senchur from this photograph. Additionally, I have a detailed record, listing the names of monastic musicians who visited London from the United States, where during said visit on the morning of June 18, 1982, Rev. Becket G. Senchur was the principal celebrant at the Eucharistic liturgy at a location in London.